Since 1872, Pirelli Tire has gone beyond the limits of technology to achieve a superior performance level. Pirelli’s advanced tire technology produces best in class all season tires, winter tires, touring tires and high performance tires for cars, trucks, motorcycles, and motorsports. Pirelli proudly features a wide range of products that are ultimately designed to reach the greatest performance and comfort on all roads and in all weather conditions. Using the latest tread compounds, Pirelli tires achieve superior tread wear, excellent traction, exceptional handling and an overall comfortable ride. With its extensive experience in the tire industry, commitment to pristine quality during research and development, and its large sales network, Pirelli Tire holds leadership across the globe. "Power is nothing without control" is the root of Pirelli’s product development process. Pirelli Tires prides itself in producing high performance products, combined with responsibility, safety and respect for the environment and sustainability. The P Zero All Season Plus is the Ultra Performance All-Season tire of Pirelli’s P Zero family. Not only is this model tire designed to meet all- weather needs, it is built to last without giving up that premium driving experience, whether you are driving on a snowy trail or chasing the sun. All encompassing grooves expunge water to resist hydroplaning, while large grooves between the blocks expel excess water and capture more snow. This ultra high performance tire features a smooth and powerful ride for more confident handling and optimal gripping capacity. Both lower weight and less noise producing than its predecessor, this tire has remarkably enhanced its ability of wet braking and year-round traction, even in light snow. The tread compound houses low oil and high-silica content to reduce braking distances and rolling resistance. The Scorpion Verde™ All Season Plus is the ideal selection for crossovers, SUVs, and select pickups. It focuses on drivers that seek higher mileage results, comfort, and safety in every condition. Energy efficient tires decrease fuel consumption and CO2 emissions, and it’s also made from eco-compatible materials to help decrease the carbon footprint. 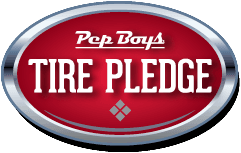 Celebrating more than 90 years in business, Pep Boys is your ultimate one-stop solution for automotive service and retail needs. Our professional ASE-certified Pep Boys technicians are trained to diagnose and repair the broken or faulty components that make up your vehicle’s complex systems, in addition to installing top-of-the-line tires such as Pirelli. Trust Pep Boys to provide outstanding car service by using state-of-the-art technology designed to diagnose and repair the critical systems that keep your vehicle running efficiently. Thanks to approximately 1,000 locations in 35 states and Puerto Rico, our locations are well-equipped to handle any repair, maintenance effort or upgrade.